It has been one crazy week, and last week was even more crazy with it being the start of fashion week! I was honored to be invited for the second time, and it was even more amazing than last season! I wish I could have attended all the shows I was invited to, however, I was only able to check out Dan Liu, Hakan Akkaya, and Mac Duggal! By far, Hakan Akkaya was my favorite show. There were so many high fashion, eye-catching looks! Not only was the runway amazing, but dressing up for the shows, and seeing all of the street style was really great. I hope you all enjoy my looks below! 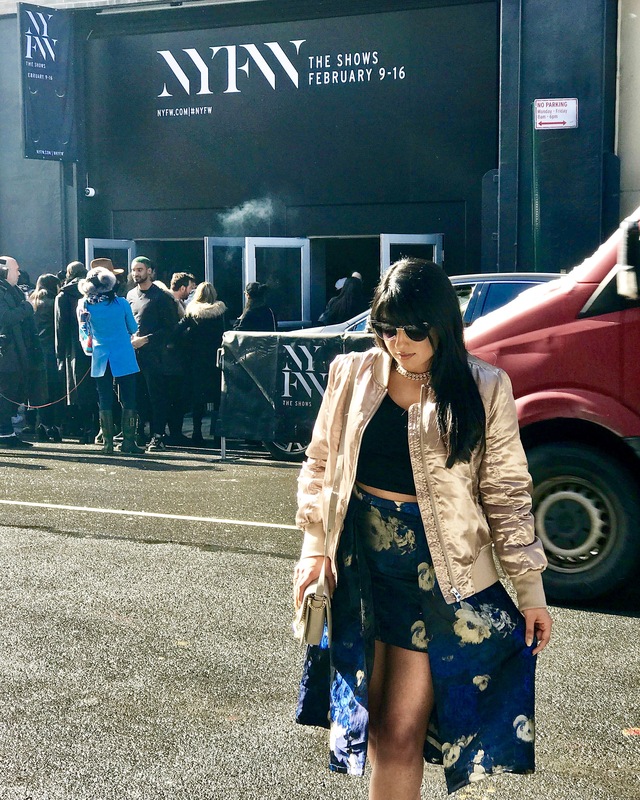 I sported a metallic gold bomber jacket with matching gold metallic booties, and a vibrant blue skirt that shared similar gold metallic accents! The bomber jacket and skirt are from Akira – and right now they are having an in-store buy one get one for a PENNY sale!! Don’t miss out. Lastly, I cant forget my cute LOVE pins! They are from H&M for less than $10! I love love love this orange and black bodycon dress from Akira. The dress is a combination of mesh, velvet, and faux leather fabric. It’s airy and provides a lot of comfort. Perfect for a long night out! Again, this dress is on major sale and so are the earrings which are from H&M.